Over the past year or so I've been toying with the idea of getting eyelash extensions. Yes, you heard me, extensions for your eyelashes. So what you've got naturally dark, full, luscious eyelashes; there will always be a Kardashian that has darker, fuller, more luscious lashes than you because they're on the extension wagon. Eyelash extensions essentially serve the same purpose as hair extensions: to add length & fullness to your natural set (top and/or bottom). If you know me personally or read my last post then you know I die for voluminous, thick, black, fabulous lashes - so why haven't I joined in on the lash extension craze? Well, for starters, I don't have the patience nor the time to spend 2-3 hours sitting back in a chair while someone delicately glues each individual eyelash extension to my individual natural lashes (this can take longer/shorter if you get more/less than a typical full set). While the process to get them refilled is shorter in time (about 1 hour), it isn't any less tedious, and as you can imagine you will be back in getting the refills every 3-6 weeks to keep them looking full/natural and not creepily long/curly/gappy as they fall out with your natural lashes (I'm sure you've seen this on some gals.. NOT CUTE). Wait.... did I mention you should expect to pay around $200-$500 initially then $60-$100 every couple weeks you go in to get them filled? No thanks. I've got surprisingly voluminous lashes as it is and to be honest - I think super dramatic lashes are the most fabulous when they're only extra Va Va Voom on occasion (I mean think about having extensions on a regular day...at work, school, church.... you can't just pull these babies off, you guys). SO... now I'll get to my point. FALSE EYELASHES! Yep. Don't be scared! I'm not waltzing around town with some ridiculous bright green sparkly lashes or anything guys (I mean I need to keep my boyfriend around, right?). In fact, I was SO SCARED to put them on myself for the longest time. I would get them put on at the MAC counter at Nordstrom every time I went to a dance in high school... but putting them on myself? Please. I already had a hard enough time learning how to put contacts in. But... I eventually learned they're really not that scary. And in fact, they are sometimes just the extra pizzazz I need to glam up my outfit for a night on the town or amp up my sultriness and self-confidence if I'm feeling a little 'blah.' OH... and they're ridiculously cheap. For real! I'm talking $4 for a pair that can be worn 3-5 times. $4 removables vs. $200+ extensions, people. 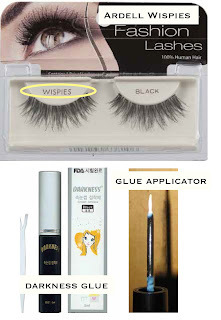 There are TONS of brands and colors and styles and lengths of false lashes out there - but I am crazy for Ardell Wispies + Darkness Glue. The lashes aren't too over the top but still give you that extra glam factor if you're needing/wanting it. This glue in particular goes on and dries black so it looks like a liner. If you've got a super steady hand you can even apply this glue like eye liner directly to your natural lash line. Can you say awesome? Because my hand is not on the steady side, my trick is to put the glue directly on the false lash strip. Whether you paint directly on your lash line or on the false lash strip; let the glue air dry for 30 seconds so it starts to feel a little sticky & then place as close to your natural lashes as you can get for it to finish drying. VOILA! Hello, gorgeous!